FAGE Yogurt Bar is a simple snack idea your kids will love! Back-to-school means busy, hungry kids! If you’re having a playdate or need a healthy snack or dessert for your crowd of kiddos, a yogurt bar is the perfect kid-friendly way to feed your family a healthy option! Let’s face it, sugary snacks and desserts are not the best choice for our kids. If they’re going to stay focused during school and have the energy for after-school activities, a healthy snack is a must! During back-to-school, I’m always on the hunt for new and creative ways to feed my girls healthy snacks. Sometimes I have to get creative! 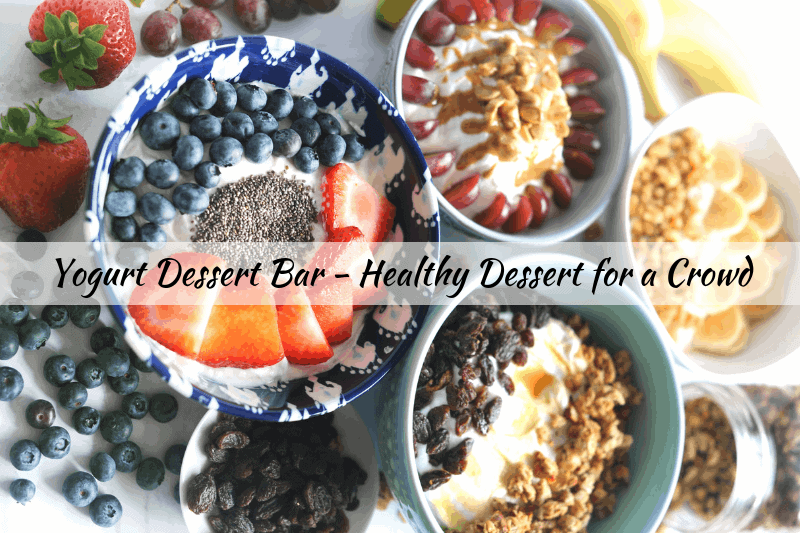 Easy Healthy Desserts Don’t Have to be Boring! FAGE helps me to create a fun and healthy yogurt bar. Since each of our family members has their own preferences, I created four different combos! These ideas are meant to be fun and mix and match! I have to admit, it’s hard for me to pick my favorite combination! 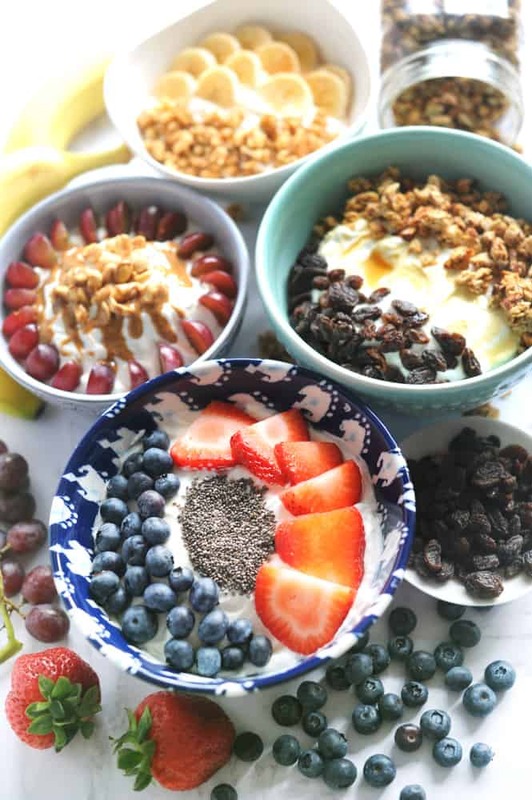 Not only does FAGE yogurt help you to get a protein-packed breakfast, but the endless combinations of fruit, nuts, granola and other healthy toppings can give you breakfast, snack, or dessert ideas for weeks! I also love that FAGE is a brand I can trust. FAGE Total 2% is Non-GMO Project Verified and additive and preservative free. 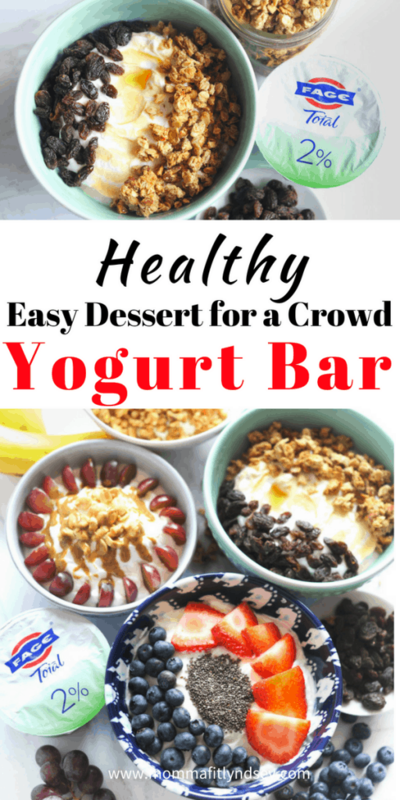 Create Your Own Yogurt Bar at Home! The options for a yogurt bar are endless! Pair FAGE Total 2% Greek yogurt with any of the following items to create your own easy healthy desserts at home! 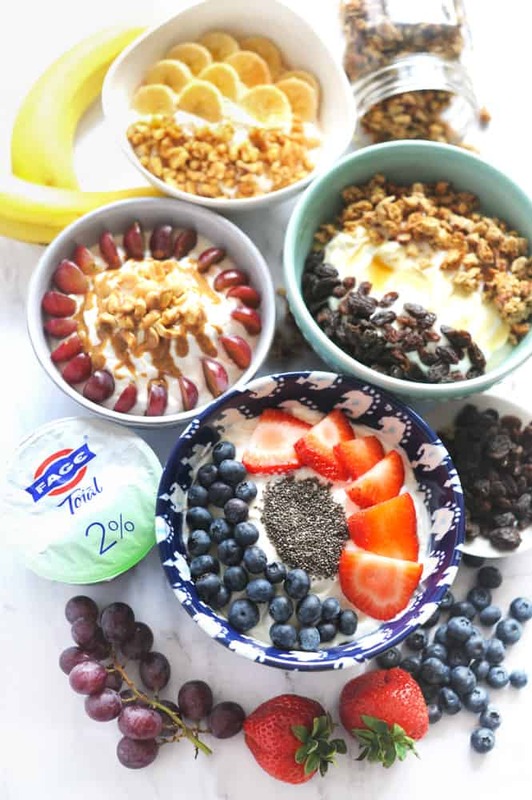 Here are a few of our family’s favorite yogurt and healthy topping combos for you to create your own FAGE yogurt bar at home! Berries are a fresh and fruity add to FAGE yogurt for a protein-rich, calcium and antioxidant filled bowl! Adding chia gives a nice texture and pumps up the nutrients! Nothing says warm and comforting like banana bread! 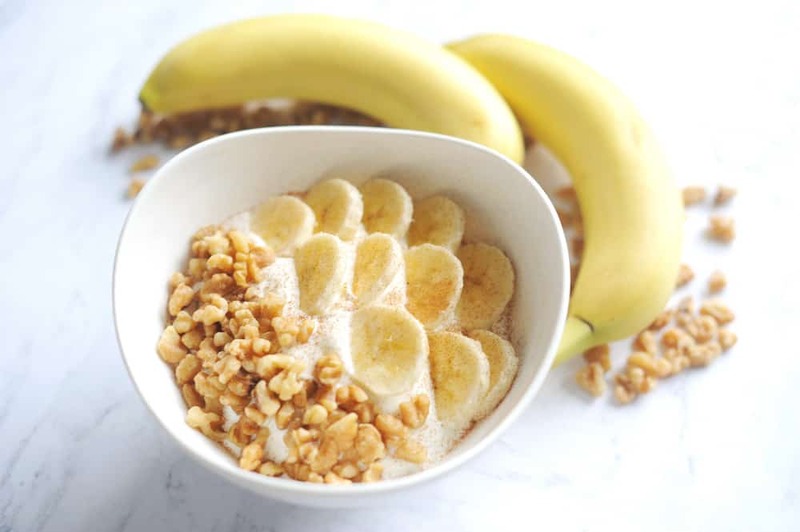 This combo couples all-natural FAGE Total 2% Greek strained yogurt with bananas and walnuts. A sprinkling of cinnamon pumps up the fall factor! What back-to-school snack is better than peanut butter & jelly? Instead of packing in extra sugar, grapes provide a natural sweetness. 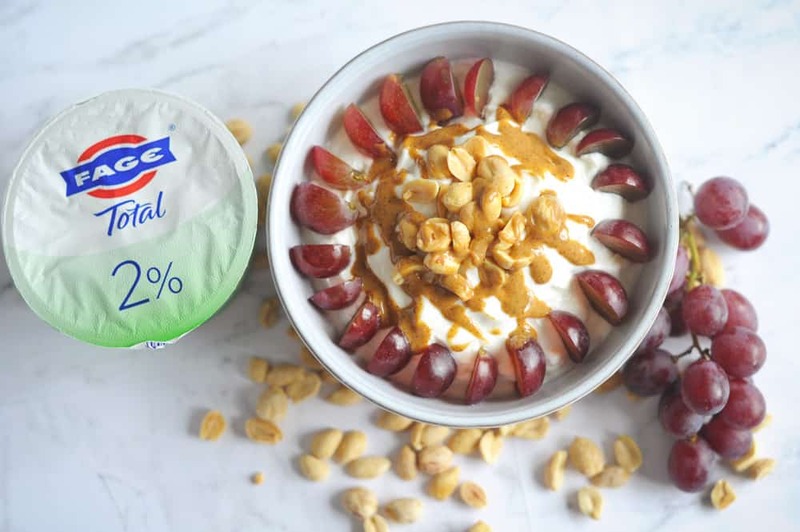 Paired with peanuts, a drizzle of peanut butter and no-added sugar FAGE Total 2% Greek Yogurt, this topping bar is a family-favorite. 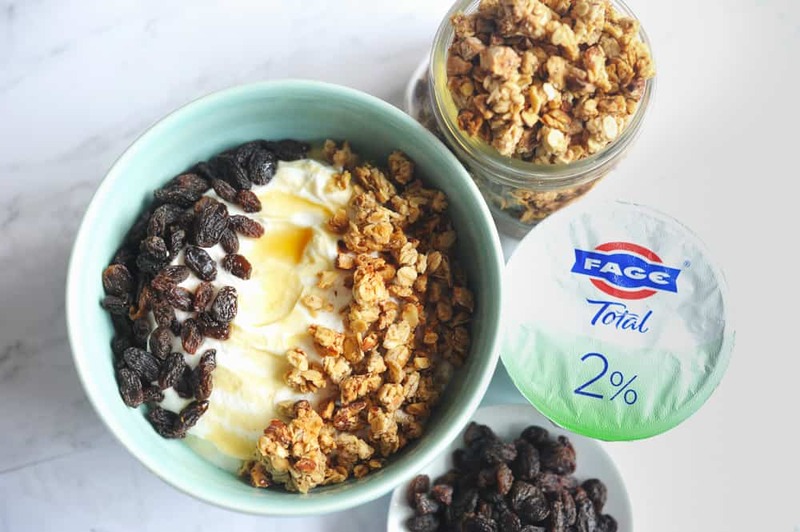 This combo of gluten-free granola, honey & raisins and gluten-free FAGE Total 2% Greek yogurt for anyone looking to eliminate gluten without missing yummy comfort food snacks! 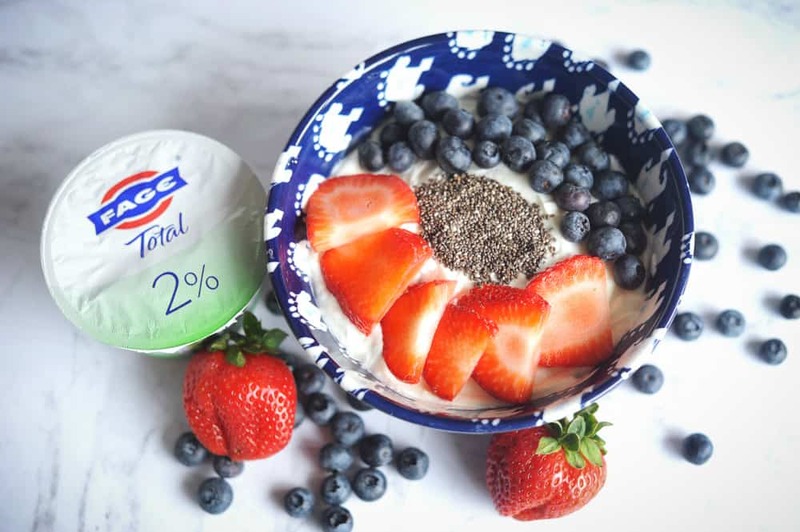 I love that this option gives a tasty crunch and a touch of natural sweetness along with gut-healthy active cultures in the FAGE Total 2% Greek yogurt. If you’re looking for easy healthy desserts to serve during back-to-school, FAGE has you covered! Where can I find FAGE? What are your favorite toppings for yogurt? Tell me about it in the comments!